The Monastery of the Ursulines of Quebec is one of the greatest treasures of convent architecture in North America. Inaccessible, since it is the private house of the nuns, it harbours marvels of art and history, enlightened by centuries of legends and anecdotes, which beg to be preserved and discovered. Two types of tours are available. In video tours you may follow our guide from room to room. 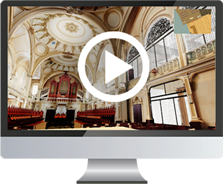 In the 3D virtual tour, you may discover the Ursuline Monastery by yourself. * The videos you will see are a reduced version of the 3D model. The image quality is compressed to suit most devices.